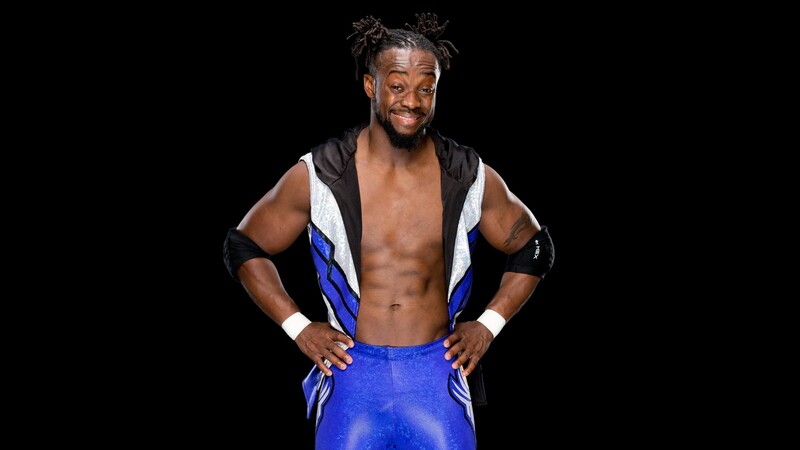 Check out Kofi Kingston’s WWE profile here! June 4, 2006 – New England championship Wrestling: Evan Siks defeated Kofi Nahaje Kingston. June 10, 2006 – New England championship Wrestling: Kofi Nahaje Kingston defeated Brian Fury. July 15, 2006 – New England championship Wrestling: Kofi Nahaje Kingston defeated Zack Static. August 11, 2006 – Chaotic Wrestling: Kofi Nahaje Kingston defeated Nick Logan. September 8, 2006 – Chaotic Wrestling: Brian Milonas w/ Cherry Payne defeated Kofi Nahaje Kingston. September 2006: Kofi Nahaje Kingston signed of a developmental contract with World Wrestling Entertainment. September 21, 2006 – Deep South Wrestling: Montel Vontavious Porter beat Kofi Nahaje Kingston in a dark match. September 28, 2006 – Deep South Wrestling: Kofi Nahaje Kingston defeated Big Bully Douglas. October 5, 2006 – Deep South Wrestling: Kofi Nahaje Kingston defeated T.J. Wilson in a dark match. October 12, 2006 – Deep South Wrestling: Kofi Nahaje Kingston defeated David Heath. October 19, 2006 – Deep South Wrestling: Kofi Nahaje Kingston defeated Claudio Castagnoli in a dark match. November 2, 2006 – Deep South Wrestling: Montel Vontavious Porter defeated Kofi Nahaje Kingston. November 15, 2006 – OVW TV Tapings: Tommy Suede and Kofi Nahaji Kingston defeated Los Locos (Raul and Ramon). November 30, 2006 – Deep South Wrestling: David Heath defeated Kofi Nahaje Kingston. December 7, 2006 – Deep South Wrestling: Oleg Prudius defeated Kofe Nahaje Kingston in a dark match. December 21, 2006 – Deep South Wrestling: Daniel Rodimer w/ Brooke Adams defeated Kofe Nahaje Kingston in a dark match. January 4, 2007 – Deep South Wrestling: Kofe Nahaje Kingston defeated Keith Samson Walker. January 11, 2007 – Deep South Wrestling: Kofi Nahaje Kingston and Suede beat Urban Assault (Sonny Siaki and Eric Perez). January 25, 2007 – Deep South Wrestling: Kofi Nahaje Kingston and Shantelle beat Brian Cage and Angel Williams (dark match). February 1, 2007 – Deep South Wrestling: Frankie Coverdale defeated Kofi Nahaje Kingston. March 8, 2007 – Deep South Wrestling: Kofi Nahaje Kingston defeated Brian Cage. March 15, 2007 – Deep South Wrestling: Kofi Nahaje Kingston defeated Jason Jones in a dark match. March 22, 2007 – Deep South Wrestling: Kofi Nahaje Kingston w/ Luscious defeated T.J. Wilson (debut). March 26, 2007 – RAW: Kofi Nahaje Kingston defeated Trevor Murdoch w/ Lance Cade in a dark match. April 2, 2007 – RAW: Kofi Nahaje Kingston defeated Stevie Richards in a dark match. April 5, 2007 – Deep South Wrestling: Kofi Nahaje Kingston w/ Luscious defeated Heath Miller. April 7, 2007 – DSW House Show: The Major Brothers and Kofi Kingston beat Shawn Osborne and Harry Smith and T.J. Wilson. April 12, 2007 – Deep South Wrestling: “The Bad Seed” Shawn Osborne defeated Kofi Nahaje Kingston w/ Luscious. June 26, 2007 – Florida championship Wrestling: Keith Walker and Ryklon Stephens defeated Eric Perez and Kofi Nahaje Kingston. June 30, 2007 – Florida championship Wrestling: Kofi Nahaje Kingston defeated Johnny Curtis. August 4, 2007 – Florida championship Wrestling: G-Rilla and The Giant Titan defeated Teddy Hart and Kofi Kingston. September 2, 2007 – FCW: T.J. Wilson and Kofi Kingston beat El Grande Los Locos Flakas w/ Fidel Madecone Martinez by Count-out. September 25, 2007 – FCW: Kofi Kingsto, Johnny Curtis and Robert Anthony beat Rycklon, Giant Titan and Steve Taylor. October 13, 2007 – Florida championship Wrestling: Kofi Kingston defeated Santino Marella in a #1 Contenders match. October 30, 2007 – FCW: Kofi Kingston and Brianna Bella (w/ Nicole Bella) beat Sheamus O’Shaunessy and Victoria Crawford. November 6, 2007 – Florida championship Wrestling: Kofi Kingston defeated “The Professional” Mike Mondo. November 10, 2007 – Florida championship Wrestling: Ted DiBiase Jr. and Kofi Kingston defeated Deuce and Domino w/ Cherry. November 13, 2007 – Florida championship Wrestling: Afa Jr. defeated Kofi Kingston to retain the FCW Southern title. November 27, 2007 – Florida championship Wrestling: Kofi Kingston beat FCW Southern Heavyweight champion Afa Jr. by disqualification. December 1, 2007 – Florida championship Wrestling: Kofi Kingston and Tommy Taylor defeated Jake Hager and Mike Mondo. December 4, 2007 – ECW on Sci-Fi: Kofi Kingston is coming to the WWE being billed as the first Jamaican WWE Super Star. December 11, 2007 – ECW on Sci-Fi: Kofi Kingston in Jamaica proclaiming that there is “TROUBLE IN PARADISE”. December 14, 2007 – SmackDown: Kofi Kingston defeated Steve Corino in a dark match. December 18, 2007 – ECW on Sci-Fi: Kofi Kingston beats up a guy on a Jamaican Beach who was stealing wallets. December 21, 2007 – SmackDown: Kofi Kingston defeated Dave Taylor in a dark match. January 8, 2008 – ECW on Sci-Fi: Kofi Kingston beats up a beach jerk who kicked in a sand castle built by some kids. January 11, 2008 – SmackDown: Sho Funaki and Kofi Kingston defeated The Highlanders in a dark match. January 18, 2008 – SmackDown: ECW’s Kofi Kingston defeated OVW’s Paul Burchill w/ Katie Lea in a dark match. January 22, 2008 – ECW on Sci-Fi: Kofi Kingston (ECW in-ring debut) defeated David Owen. February 5, 2008 – ECW on Sci-Fi: Kofi Kingston defeated James Curtis. February 12, 2008 – ECW on Sci-Fi: Kofi Kingston defeated Mike Knox to continue his winning streak. February 19, 2008 – ECW on Sci-Fi: Kofi Kingston defeated Jason Riggs to continue his winning streak. February 23, 2008 – Florida championship Wrestling: Kofi Kingston defeated “Three Superstar” Christopher Gray. March 7, 2008 – SmackDown: Kofi Kingston defeated Kevin Fertig (formerly Kevin Thorn) in a dark match. March 11, 2008 – ECW on Sci-Fi: Kofi Kingston defeated Deuce (w/ Domino and Cherry) to continue his winning streak. March 18, 2008 – ECW on Sci-Fi: Kofi Kingston defeated James Curtis to continue his winning streak. March 25, 2008 – ECW on Sci-Fi: Kofi Kingston participated in a 12-on-12 featuring participants of the WM24 Battle Royal. 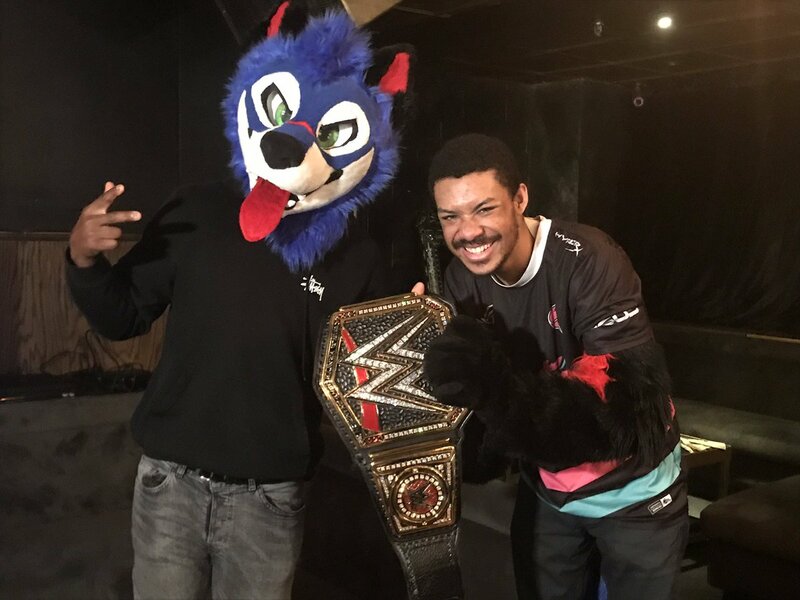 March 28, 2008: Elijah Burke won the annual WWE videogames challenge, beating Kofi Kingston in the finals at the House of Blues. March 30, 2008 – WrestleMania 24: Kofi Kingston participated in a Battle Royal on the Pre-show taped as a DVD Extra. March 31, 2008 – RAW: Kofi Kingston defeated Kenny Dykstra in a dark match. April 8, 2008 – ECW on Sci-Fi: Kofi Kingston defeated SmackDown’s Domino. April 22, 2008 – ECW on Sci Fi: Kofi Kingston defeated “The GOLD Standard” Shelton Benjamin. April 29, 2008 – ECW on Sci Fi: Kofi Kingston defeated “The GOLD Standard” Shelton Benjamin in a rematch. May 6, 2008 – ECW on Sci Fi (The 100th Episode): Kofi Kingston defeated Matt Striker to continue his winning streak. ~~~After the match, Shelton Benjamin (who had joined commentary for the match) assaulted the undefeated Kofi Kingston. May 13, 2008 – ECW on Sci Fi: Kofi Kingston interrupted Shelton Benjamin’s interview and they had a backstage brawl. May 20, 2008 – ECW on Sci Fi: Shelton Benjamin defeated Kofi Kingston in a Grudge Match to end Kofi’s winning streak! May 23, 2008 – SmackDown: Matt Hardy and Kofi Kingston defeated Elijah Burke and Shelton Benjamin in an Interpromotion match. May 27, 2008 – ECW on Sci Fi: Kofi Kingston defeated Mike Knox (Shelton Benjamin joined in on commentary for the match). June 10, 2008 – ECW on Sci Fi: Kofi Kingston and Evan Bourne (Matt Sydal) defeated Shelton Benjamin and Mike Knox. June 17, 2008 – ECW on Sci Fi: Kofi Kingston defeated Mike Knox by disqualification after Shelton Benjamin attacked Kofi Kingston. June 24, 2008 – ECW on Sci Fi: Kofi Kingston defeated Shelton Benjamin in an Extreme Rules Grudge match. June 25, 2008: Kofi Kingston was drafted to RAW via the WWE.com supplemental draft series. June 30, 2008 – RAW: Kofi Kingston defeated Chris Jericho by disqualification (for breaking the rules) to retain the WWE Intercontinental title. July 7, 2008 – RAW: WWE Intercontinental champion Kofi Kingston defeated Charlie Haas in a Non-title match. ~~~After the match, Paul Burchill attacked Kofi Kingston and gave him a Diamond Cutter, followed by a stiff Curb-stomp. July 14, 2008 – RAW: Mickie James defeated Katie Lea w/ Paul Burchill to retain the WWE Women’s title..
~~~Kofi Kingston w/ Mickie James defeated Paul Burchill w/ Katie Lea to retain the WWE Intercontinental title. July 21, 2008 – RAW: Paul Burchill and Katie Lea defeated Kofi Kingston and Mickie James in an Inter-gender match. August 4, 2008 – RAW: Kofi Kingston defeated Paul Burchill w/ Katie Lea to retain the WWE Intercontinental title. ~~~Santino Marella w/ Beth Phoenix defeated Mickie James w/ Kofi Kingston in an Intergender Match (Santino’s challenge). August 25, 2008 – RAW: Santino Marella defeated Kofi Kingston with help from Beth to retain the WWE Intercontinental title. September 1, 2008 – RAW: Kofi Kingston defeated Charlie Haas (dressed as John Cena). September 8, 2008 – RAW: Ted DiBiase Jr. and Cody Rhodes and Manu defeated Kofi Kingston and Cryme Tyme (Shad Gaspard and JTG). September 15, 2008 – RAW: Ted DiBiase Jr. and Cody Rhodes and Manu defeated Kofi Kingston and Jerry Lawler and Jim (Charlie) Haas. October 6, 2008 – RAW: Ted DiBiase Jr. (w/ Cody Rhodes and Manu) defeated Kofi Kingston (w/ C.M. Punk). November 18, 2008 – ECW on Sci-Fi: Mark Henry and William Regal and Cody Rhodes beat Matt Hardy and Fit Finlay and Kofi Kingston. November 24, 2008 – RAW: Kofi Kingston defeated Kane by disqualification in the 1st Round of an IC Title Shot Tournament. December 22, 2008 – RAW: Kofi Kingston defeated Manu w/ Cody Rhodes in a singles match. January 19, 2009 – RAW: Kofi Kingston participated in a six-man Battle Royal to preview the Royal Rumble (won by Randy Orton). January 25, 2009 – Royal Rumble: Kofi Kingston entered the Royal Rumble at #22 before getting eliminated by Brian Kendrick. January 26, 2009 – RAW: Kofi Kingston defeated Kane in an Elimination Chamber Qualifying Match. February 15, 2009 – No Way Out: Edge attacked Kofi Kingston and stole his spot in the RAW Elimination Chamber Match. March 9, 2009 – RAW: Kofi Kingston defeated Chris Jericho in a Money in the Bank Qualifying Match. March 13, 2009 – SmackDown: World Heavyweight champion Edge defeated RAW Superstar Kofi Kingston by Submission. March 27, 2009 – SmackDown: Christian and Finlay and Kane and Shelton Benjamin beat CM Punk and Kofi Kingston and MVP and Mark Henry. ~~~C.M. Punk beat Kofi Kingston and Kane and Montel Vontavious Porter and Shelton Benjamin and Christian and Fit Finlay and Mark Henry. April 6, 2009 – RAW: Kofi Kingston defeated Shelton Benjamin in a dark match. April 10, 2009 – SmackDown: The Big Show defeated Kofi Kingston by knockout: A valiant effort by Kofi Kingston. April 23, 2009 – Superstars: Edge defeated Kofi Kingston. April 26, 2009 – Backlash: Kofi Kingston defeated Dolph Ziggler in a dark match. April 27, 2009 – RAW: Kofi Kingston defeated THE Brian Kendrick. May 4, 2009 – RAW: Kofi Kingston defeated Matt Hardy (after the match, Hardy knocked Kofi out with his cast). May 11, 2009 – RAW: Montel Vontavious Porter and Kofi Kingston defeated William Regal and Matt Hardy in a tag team match. May 21, 2009 – Superstars: Kofi Kingston defeated William Regal. May 25, 2009 – RAW: Kofi Kingston beat Matt Hardy and William Regal in a 3-WAY #1 Contenders match for the U.S. title. June 1, 2009 – RAW: Kofi Kingston defeated Montel Vontavious Porter to win the WWE United States title. June 7, 2009 – Extreme Rules: Kofi Kongston beat MVP and Matt Hardy and William Regal in a 4-WAY to retain the U.S. title! June 8, 2009 – RAW: WWE United States champion Kofi Kingston defeated William Regal. June 15, 2009 – RAW “Three-For-All”: Participated in a 10-Man Battle Royal with the winner facing Randy Orton at The Bash. June 25, 2009 – Superstars: Kofi Kingston defeated MVP and Matt Hardy in a 3-WAY to retain the WWE United States title. July 13, 2009 – RAW: The Big Show defeated Evan Bourne by submission (Kofi Kingston made the save after the match). July 16, 2009 – Superstars: The Big Show defeated WWE U.S. champion Kofi Kingston in a Non-title match. July 27, 2009 – RAW: WWE United States champion Kofi Kingston defeated THE Brian Kendrick in 5 seconds. September 10, 2009 – Superstars: Jack Swagger and Mike Mizanin defeated Primo Colon and Kofi Kingston. September 13, 2009 – Breaking Point: Kofi Kingston defeated Mike Mizanin to retain the WWE United States title. September 14, 2009 – RAW: Jack Swagger and Mike Mizanin defeated Kofi Kingston and Primo Colon in a tag team match. ~~~Late in the match, The Miz walked off with Kingston’s WWE U.S. belt – and Swagger rolled up a distracted Kingston! ~~~WWE United States champion Kofi Kingston defeated Jack Swagger by Countout to retain the WWE U.S. championship. ~~~the Miz ran down and stole the U.S. belt AGAIN, but Swagger jumped out and stole the belt from the Miz and left with it. September 28, 2009 – RAW: Jack Swagger (wearing the stolen United States belt) defeated Evan “Air” Bourne in a singles match. October 1, 2009 – Superstars: WWE United States champion Kofi Kingston defeated The Miz in a Non-title match. October 4, 2009 – Hell in a Cell: Kofi Kingston defeated Jack Swagger and The Miz to retain the WWE United States title. October 5, 2009 – RAW: The Miz demanded that “guest host” Ben Roethlisberger grant him another U.S. title match tonight! ~~~LATER THAT NIGHT: Mike “The Miz” Mizanin defeated Kofi Kingston to capture the WWE United States title!Kofi Kingston is now billed from Ghana, West Africa (he was legit born there) so he isn’t “Jamaican” any more. Vince McMahon wanted to use him in more speaking roles and his Jamaican accent wasn’t very convincing. Kingston’s parents moved to the United States in 1981 when he was an infant but he grew up in Cambridge, Massachusetts. October 12, 2009 – RAW: Kofi Kingston defeated Evan Bourne to qualify for Team RAW at Bragging Rights. October 25, 2009 – Bragging Rights: Team SmackDown defeated Team RAW when the Big Show turned on Team RAW. ~~~~MAIN EVENT: Kofi Kingston stopped Legacy members from interfering and cost Randy Orton the WWE championship. ~~~LATER: Legacy members Rhodes and DiBiase gave Randy Orton a custom made Nascar with his picture air-brushed on the hood. ~~~Kofi Kingston got some revenge by destroying the race car with a crowbar, some key scratching, and a little orange paint! November 2, 2009 – RAW: Randy Orton vs. Kofi Kingston ended in a No Contest after members of Legacy interfered. ~~~Kofi Kingston and Montel Vontavious Porter and Mark Henry defeated Randy Orton and Legacy (Ted DiBiase and Cody Rhodes). November 9, 2009 – RAW: Randy Orton (w/ Ted DiBiase Jr. and Cody Rhodes) defeated Mark Henry (w/ MVP and Kofi Kingston). November 16, 2009 – RAW in Madison Square Garden: Randy Orton appeared and beat up RAW guest host Rowdy Roddy Piper. ~~~Kofi Kingston showed up for a brawl with Randy Orton, ending with a spectacular jump off a rail putting Orton through a table! November 22, 2009 – Survivor Series: Team Kofi defeated Team Orton in a Survivor Series Elimination match. November 30, 2009 – RAW: Randy Orton defeated Kofi Kingston with an RKO in a Grudge match. ~~~Cody Rhodes attacked Kingston before the match, then Ted DiBiase attacked Kingston – but he still wanted to fight. December 7, 2009 – RAW: Kofi Kingston defeated Randy Orton in a rematch after referee Mark Cuban did a quick three count. ~~~RAW guest host Mark Cuban banned Legacy from the building and got revenge for Orton RKOing him six years ago on PPV! December 13, 2009 – TLC PPV: Randy Orton defeated Kofi Kingston in a super grudge match. December 14, 2009 – Slammy Awards: Kofi Kingston defeated Legacy member Cody Rhodes by disqualification when Ted DiBiase interfered. ~~~Legacy (Ted DiBiase Jr. and Cody Rhodes) defeated Kofi Kingston and Evan Bourne in an impromptu tag team match. ~~~Kofi Kingston was nominated for “Extreme Moment of the Year” for his Boom-drop on Randy Orton at Madison Square Garden. December 21, 2009 – RAW: Kofi Kingston and Evan Bourne and Mark Henry defeated Randy Orton and Ted DiBiase Jr. and Cody Rhodes. December 28, 2009 – RAW: Kofi Kingston defeated Mike Mizanin to earn an immediate shot at the Miz’s WWE United States title. ~~~Kofi Kingston defeated WWE United States champion Mike “The Miz” Mizanin by disqualification after interference from Randy Orton. January 25, 2010 – RAW: Kofi Kingston defeated WWE U.S. champion The Miz in a Non-title match after distraction from MVP. January 31, 2010 – Royal Rumble: Kofi Kingston entered the Royal Rumble at #27 before he was eliminated by John Cena. February 15, 2010 – RAW: Ted DiBiase Jr. defeated Kofi Kingston in an Elimination Chamber Preview match. February 22, 2010 – RAW: Kofi Kingston and Yoshi Tatsu and Evan Bourne defeated Randy Orton and Cody Rhodes and Ted DiBiase. March 4, 2010 – Superstars: Kofi Kingston defeated Chavo Guerrero. March 15, 2010 – RAW: WWE champion Batista defeated Kofi Kingston in a Non-title match. March 22, 2010 – RAW: Kofi Kingston defeated Vladimir Kozlov to qualify for the Money in the Bank match. March 26, 2010 – SmackDown: SmackDown defeated RAW in a Money in the Bank Preview 10-Man tag team Match. April 26, 2010 – 2010 Draft Special: Kofi Kingston was drafted to the SmackDown brand and fought with Chris Jericho. April 30, 2010 – SmackDown: Kofi Kingston defeated Chris Jericho. May 14, 2010 – SmackDown: Kofi Kingston defeated Christian in the Finals to win the vacant WWE Intercontinental title. ~~~After the match, former champion Drew McIntyre produced a letter from Vince McMahon overruling Theodore Long’s decision. ~~~General Manager Teddy Long was forced to take the belt away from Kofi Kingston and return it to the arrogant Drew McIntyre! May 23, 2010 – Over The Limit: Kofi Kingston defeated Drew McIntyre to win the WWE Intercontinental title. May 28, 2010 – SmackDown: The Big Show and Kofi Kingston defeated World Heavyweight champion Jack Swagger and Drew McIntyre. June 1, 2010 – NXT: Kofi Kingston introduced his NXT rookie, Mike McGillicutty (aka Joe Hennig, son of Mr. Perfect). June 4, 2010 – SmackDown: Kofi Kingston defeated Drew McIntyre to retain the WWE Intercontinental title. June 10, 2010 – Superstars: WWE Intercontinental champion Kofi Kingston defeated Luke Gallows in a Non-title match. June 15, 2010 – NXT: Kofi Kingston and Michael McGillicutty defeated Mark Henry and Jason “Lucky” Cannon. June 17, 2010 – WWE Superstars: Kofi Kingston w/ Mike McGillicutty defeated Trent Barreta w/ Caylen Croft in a Non-title match. June 18, 2010 – SmackDown: Drew McIntyre defeated General Manager Theodore Long – (Drew forced Long to lay down for him). ~~~Kofi Kingston tried to prevent a post-match assault, but Drew’s security held him back – Matt Hardy showed up to save Long! June 20, 2010 – Fatal 4-WAY PPV: Kofi Kingston defeated Drew McIntyre to retain the WWE Intercontinental title. ~~~The referee was knocked out so McIntyre forced Theodore Long (who was sitting at ringside) to replace the unconcious referee. ~~~Matt Hardy showed up and hit McIntyre with the Twist of Fate – Kofi followed up with the Trouble in Paradise to win the match! June 22, 2010 – NXT: Michael McGillicutty w/ Kofi Kingston defeated Titus O’Neil w/ Zack Ryder. July 2, 2010 – SmackDown: WWE Intercontinental champion Kofi Kingston defeated Dolph Ziggler w/ Vickie Guerrero. July 6, 2010 – NXT: Michael McGillicutty w/ Kofi Kingston defeated “Showtime” Percy Watson w/ Montel Vontavious Porter. July 9, 2010 – SmackDown: Drew McIntyre defeated Kofi Kingston to qualify for the SmackDown Money in the Bank match. July 16, 2010 – SmackDown: Kofi Kingston vs. “Dashing” Cody Rhodes ended in a No Contest when Kane destroyed both of them. July 23, 2010 – SmackDown: Dolph Ziggler w/ Vickie Guerrero defeated WWE IC champion Kofi Kingston in a Non-title match. July 30, 2010 – SmackDown: Dolph Ziggler w/ Vickie Guerrero defeated WWE Intercontinental champion Kofi Kingston by disqualification. August 3, 2010 – NXT: Michael McGillicutty w/ Kofi Kingston defeated Lucky Cannon w/ Mark Henry with a swinging neckbreaker. ~~~WWE United States champion Mike “The Miz” Mizanin w/ Alex Riley defeated Michael McGillicutty w/ Kofi Kingston. August 6, 2010 – SmackDown: Dolph Ziggler w/ Vickie Guerrero defeated Kofi Kingston to win the WWE Intercontinental title! August 13, 2010 – SmackDown: World Heavyweight champion Kane defeated Kofi Kingston in a Non-title match. August 15, 2010 – SummerSlam: WWE IC champion Dolph Ziggler w/ Vickie Guerrero vs. Kofi Kingston ended in a No Contest. August 17, 2010 – NXT: Zack Ryder defeated Michael McGillicutty w/ Kofi Kingston with a Rough Ryder. August 17, 2010 – NXT: Kofi Kingston w/ Michael McGillicutty defeated Alex Riley in a squash match. August 27, 2010 – SmackDown: Kofi Kingston defeated WWE Intercontinental champion Dolph Ziggler w/ Vickie Guerrero by countout. September 2, 2010 – WWE Superstars: Kofi Kingston defeated Chavo Guerrero ..
September 19, 2010 – Night of champions: Dolph Ziggler (w/ Vickie Guerrero and Kaitlyn) defeated Kori Kingston to retain the WWE Intercontinental title. September 30, 2010 – Superstars: Kofi Kingston defeated Jack Swagger by disqualification . October 8, 2010 – SmackDown:WWE tag team champions Drew McIntyre and Cody Rhodes defeated Kaval and Kofi Kingston. October 15, 2010 – SmackDown: Kofi Kingston defeated Drew McIntyre to qualify for Team SmackDown at the Bragging Rights PPV. November 19, 2010 – SmackDown: Dashing Cody Rhodes defeated Kofi Kingston in a Survivor Series Preview Showdown Match. November 26, 2010 – SmackDown: Kofi Kingston defeated Jack Swagger w/ The Swagger Soaring Eagle to qualify for King of the Ring. December 10, 2010 – SmackDown: Kofi Kingston defeated WWE IC champion Dolph Ziggler by disqualification after interference by Jack Swagger. December 13, 2010 – The Slammy Awards: Kofi Kingston and Daniel Bryan defeated Dolph Ziggler (w/ Vickie) and Ted DiBiase (w/ Maryse). December 28, 2010 – NXT: Conor O’Brian (w/ Alberto Del Rio) defeated Derrick Bateman w/ Kofi Kingston (sub for Daniel Bryan). January 7, 2011 – SmackDown: Kofi Kingston defeated Dolph Ziggler w/ Vickie Guerrero to win the WWE Intercontinental title!! January 28, 2011 – SmackDown: Kofi Kingston and Rey Mysterio defeated Alberto Del Rio and Kane in a tag team match. January 30, 2011 – Royal Rumble: Kofi Kingston entered the Royal Rumble at #26 but was later eliminated by Randy Orton. February 4, 2011 – SmackDown: Drew McIntyre defeated Kofi Kingston after outside distraction from Alberto Del Rio. February 11, 2011 – SmackDown: Alberto Del Rio defeated WWE Intercontinental champion Kofi Kingston in a Non-title match. February 18, 2011 – SmackDown: The Miz w/ Alex Riley beat Kofi Kingston in a Non-title match after interference by Alberto Del Rio. February 20, 2011 – Elimination Chamber: Alberto Del Rio w/ Ricardo Rodriguez defeated Kofi Kingston in a Non-title grudge match. February 21, 2011 – RAW: Kofi Kingston attacked Alberto during his entrance, but Alberto fought back and put Kofi in an arm-bar. March 13, 2011 – Live Event: I.C champion Kofi Kingston defeated Cody Rhodes and Drew McIntyre in a 3-way to retain. March 18, 2011 – SmackDown: United States champion Sheamus defeated Intercontinental champion Kofi Kingston in a non-title match. March 19, 2011 – Live Event: Intercontinental champion Kofi Kingston defeated Drew McIntyre to retain. March 20, 2011 – Live Event: Intercontinental champion Kofi Kingston defeated Cody Rhodes and Drew McIntyre in a 3-way to retain. March 25, 2011 – SmackDown: Wade Barrett w/ The Corre defeated Kofi Kingston to win the WWE Intercontinental title. March 27, 2011 – Live Event: Intercontinental Champion Wade Barrett defeated Kofi Kingston to retain. April 1, 2011 – SmackDown: Kofi Kingston defeated WWE Intercontinental champion Wade Barrett by disqualification after the Corre attacked Kofi. April 8, 2011 – SmackDown: Kofi Kingston and Kane and Big Show and Santino defeated The Corre in a Best 2/3 Falls Match. April 15, 2011 – SmackDown: Ezekiel Jackson w/ The Corre defeated Kofi Kingston. April 16, 2011 – Live Event: Kofi Kingston won a #1 contenders Intercontinental Title Battle Royal. Intercontinental champion Wade Barrett defeated Kofi Kingston to retain. April 22, 2011 – SmackDown: Wade Barrett defeated Kofi Kingston to retain the WWE Intercontinental title. April 25, 2011 – RAW: Kofi Kingston and The Big Show won a SD! vs RAW Battle Royal – Kofi was drafted to RAW. Kofi Kingston defeated U.S. champion Sheamus in a non-title match. April 29, 2011 – SmackDown: Sheamus attacked Kofi Kingston as he made his way to ring. May 2, 2011 – RAW: WWE United States champion Kofi Kingston and Rey Mysterio defeated Drew McIntyre and Jack Swagger. May 6, 2011 – Live Event: Kofi Kingston and Rey Mysterio defeated CM Punk and Alberto Del Rio. May 9, 2011 – RAW: WWE United States champion Kofi Kingston defeated Jack Swagger in a Non-title match. May 11, 2011 – Live Event: Kofi Kingston and The Big Show defeated CM Punk and Alberto Del Rio. May 16, 2011 – RAW: C.M. Punk defeated WWE United States champion Kofi Kingston in a Non title match. May 23, 2011 – RAW: WWE United States champion Kofi Kingston defeated Drew McIntyre in a non-title match. May 30, 2011 – RAW: Dolph Ziggler defeated WWE United States champion Kofi Kingston in a non-title match. June 6, 2011 – RAW: WWE United States champion Kofi Kingston defeated Zack Ryder in a non-title match. June 13, 2011 – RAW: WWE United States champion Kofi Kingston and Evan Bourne defeat Dolph Ziggler and Jack Swagger. June 17, 2011 – Live Event: WWE champion John Cena and U.S. champion Kofi Kingston defeated CM Punk and R-Truth. June 19, 2011 – Capitol Punishment: Dolph Ziggler defeated Kofi Kingston to become the new United States champion. June 20, 2011 – RAW: Kofi Kingston defeated WWE United States champion Dolph Ziggler in a 2 out of 3 falls match. ~~~Ziggler won the first fall, Kingston won the second fall, and Kingston won the final fall via disqualification when Dolph hit him with a microphone. ~~~Dolph Ziggler retains the title due to the disqualification – After the match Dolph tried to attack Kofi but Kofi hit the Trouble in Paradise instead! June 27, 2011 – RAW: Kofi Kingston defeated WWE United States champion Dolph Ziggler in a “Player’s Choice” match . ~~~Kofi chose the match via RAW Roulette; Kofi chose to have Vickie Guerrero banned from ringside as the stipulation. July 4, 2011 – RAW: WWE United States champion Dolph Ziggler and Vickie Guerrero staged a “birthday party” for America. ~~~Dolph said that he is a once in a lifetime wrestler. Kofi interrupted and pushed Dolph into Vickie who landed in a cake. ~~~Kofi then kicked Ziggler into Vickie who landed face first in the birthday cake… Kofi chased Dolph to the back! July 6, 2011 – Live Event: Dolph Ziggler defeated Kofi Kingston. July 18, 2011 – RAW: Kofi Kingston defeated Alberto Del Rio in the round 1 of the WWE championship Tournament. Mike Mizanin defeated Kofi Kingston to advance in the semi-finals. July 25, 2011 – RAW: Alberto Del Rio defeated Kofi Kingston. August 8, 2011 – RAW: The Miz defeated Kofi Kingston. August 15, 2011 – RAW: Kofi Kingston and Evan Bourne defeated David Otunga and Michael McGillicutty to win the tag team Titles. August 20, 2011 – Live Event: WWE tag team champions Kofi Kingston and Evan Bourne defeated David Otunga and Michael McGillicutty to retain the Titles. August 22, 2011 – RAW: WWE tag team champions Kofi Kingston and Evan Bourne defeated David Otunga and Michael McGillicutty to retain the Titles. August 29, 2011 – RAW: WWE tag team champions Kofi Kingston and Evan Bourne defeated Michael McGillicutty and David Otunga to retain the titles. September 5, 2011 – RAW: WWE tag team champions Kofi Kingston and Evan Bourne defeated Jinder Mahal and The Great Khali to retain the titles. September 9, 2011 – Live Event: WWE tag team champions Air Boom defeated The Miz and R-Truth to retain. September 9, 2011 – SmackDown: WWE tag team champions Kofi Kingston and Evan Bourne defeated The Great Khali and Jinder Mahal in a non-title match. September 12, 2011 – RAW: The Miz defeated Kofi Kingston. September 23, 2011 – SmackDown: WWE tag team champions Kofi Kingston and Evan Bourne defeated The Uso’s in a non-title match. October 7, 2011 – SmackDown: United States champion Dolph Ziggler and Jack Swagger defeated WWE tag team champions Kofi Kingston and Evan Bourne in a non-title match. October 20, 2011 – Superstars: WWE tag team champions Evan Bourne and Kofi Kingston defeated Drew McIntyre and Michael McGillicutty in a non-title match. October 28, 2011 – SmackDown: Mike Mizanin and R-Truth defeated WWE tag team champions Kofi Kingston and Evan Bourne in a non-title match. October 31, 2011 – RAW: Cody Rhodes and Wade Barrett defeated WWE tag team champions Evan Bourne and Kofi Kingston in a non-title match. November 7, 2011 – RAW: WWE champion Alberto Del Rio defeated Kofi Kingtson in a non-title match. Novembe 18, 2011 – SmackDown: Kofi Kingston defeated Hunico. November 21, 2011 – RAW: Wade Barrett defeated Kofi Kingston. November 29, 2011 – Smackdown: Kofi Kingston was in the battle royal won by Hornswoggle. December 1, 2011 – Superstars: Primo Colon defeated Kofi Kingston. December 13, 2011 – Tritube to the Troops: Epico and Primo Colon defeated WWE tag team champions Kofi Kingston and Evan Bourne in a non-title match. December 26, 2011 – RAW: Evan Bourne and Kofi Kingston defeated Tyler Reks and Curt Hawkins in a dark match. December 28, 2011 – Live Event: WWE tag team champions Kofi Kingston and Evan Bourne defeated Epico and Primo Colon to retain. January 6, 2012 – SmackDown: Primo and Epico Colon defeated WWE tag team champions Kofi Kingston and Evan Bourne in a non-title match. January 9, 2012 – RAW: World Heavyweight champion Daniel Bryan defeated Kofi Kingston in a non-title match. January 15, 2012 – Live Event: Carlito and Epico won the WWE tag team titles by defeating Kofi Kingston and Evan Bourne. January 26, 2012 – Superstars: Kofi Kingston defeated Michael McGillicutty. January 30, 2012 – RAW: Kofi Kingston defeated Mike Mizanin. February 9, 2012 – Live Event: Chris Jericho defeated Kofi Kingston. February 20, 2012 – RAW: R-Truth and Kofi Kingston defeated WWE tag team champions Epico and Primo Colon in a non-title match. Chris Jericho defeated The Big Show, Cody Rhodes, R-Truth, Kofi Kingston, The Miz, The Great Khali, Wade Barrett and Santino Marella in a 10 man #1 contenders battle royal. March 7, 2012 – Superstars: Kofi Kingston defeated Dolph Ziggler. March 16, 2012 – SmackDown: Kofi Kingston defeated David Otunga. March 18, 2012 – Live Event: WWE tag team champions Epico and Primo Colon defeated Kofi Kingston and R-Truth to retain. April 2, 2012 – RAW: Kofi Kingston defeated Cody Rhodes. April 16, 2012 – RAW: Daniel Bryan defeated Kofi Kingston. April 17, 2012 – Live Event: Kofi Kingston and R-Truth defeated WWE tag team champions Epico and Primo in a non-title match. April 23. 2012 – RAW: Chris Jericho defeated Kofi Kingston. May 4, 2012 – Smackdown: WWE tag team champions Kofi Kingston and R-Truth defeated Hunico and Camacho in a non-title match. May 14, 2012 – RAW: Brodus Clay and the WWE tag team champions R-Truth and Kofi Kingston defeated The Miz, Dolph Ziggler, and Jack Swagger. May 24, 2012 – Superstars: WWE tag team champions Kofi Kingston and R-Truth defeated Michael McGillicutty and JTG non-title match. June 1, 2012 – Live Event: WWE tag team champions Kofi Kingston and R-Truth defeated Epico and Primo to retain. June 6, 2012 – Live Event: Epico and Primo Colon defeated Kofi Kingston and Zack Ryder. June 28, 2012 – Superstars: Kofi Kingston defeated Michael McGuillicutty. July 2, 2012 – RAW: WWE tag team champions Kofi Kingston and R-Truth, Intercontinental champion Christian and U.S. champion Santino Marella defeated Darren Young, Titus O’Neil, Cody Rhodes and David Otunga. July 3, 2012 – SmackDown: Kofi Kingston was in the 20 man battle royal won by Zack Ryder. July 5, 2012 – Superstars: Kofi Kingston defeated Rob Cabildo. July 15, 2012 – Money in the Bank: WWE tag team champions Kofi Kingston and R-Truth defeated Hunico and Camacho in a non-title match. August 9, 2012 – Superstars: Kofi Kingston defeated Heath Slater. August 24, 2012 – SmackDown: WWE tag team champions Kofi Kingston and R-Truth defeated Primo and Epico Colon in a non-title match. September 10, 2012 – RAW: WWE tag team champions Kofi Kingston and R-Truth defeated U.S. champion Antonio Cesaro and Intercontinental champion Mike Mizanin in a non-title match. September 14, 2012 – SmackDown: Kane defeated Kofi Kingston. September 16, 2012 – Night of Champions: Kane and Daniel Bryan defeated WWE tag team champions Kofi Kingston and R-Truth to win the tag team titles. September 17, 2012 – RAW: WWE tag team champions Kane and Daniel Bryan defeated Kofi Kingston and R-Truth to retain the titles. September 20, 2012 – Superstars: Kofi Kingston defeated Dean Ambrose in a dark match. September 27, 2012 – Superstars: Dolph Ziggler defeated Kofi Kingston. October 10, 2012 – Main Event: Kofi Kingston defeated Michael McGillicutty. October 15, 2012 – RAW: Kofi Kingston defeated Intercontinental champion Mike Mizanin in a non-title match. October 17, 2012 – Main Event: Kofi Kingston won the WWE Intercontinental title defeating The Miz in Memphis, TN. The match was broadcast on October 18, 2012. October 22, 2012 – RAW: Intercontinental champion Kofi Kingston defeated Michael McGillicutty in a non-title match. October 28, 2012 – Hell in a Cell: WWE Intercontinental champion Kofi Kingston defeated The Miz to retain the title. October 29, 2012 – RAW: Intercontinental champion Kofi Kingston defeated U.S. champion Antonio Cesaro by disqualification in a non-title. November 2, 2012 – SmackDown: WHC The Big Show and Mike Mizanin defeated Intercontinental champion Kofi Kingston and Sheamus. November 5, 2012 – RAW: Intercontinental champion Kofi Kingston defeated Alberto DelRio in a non-title match. November 6, 2012 – SmackDown: Intercontinental champion Kofi Kingston defeated Mike Mizanin to retain. November 12, 2012 – RAW: Alberto Del Rio and Dolph Ziggler defeated Intercontinental champion Kofi Kingston and Randy Orton. November 16, 2012 – SmackDown: Damian Sandow defeated Kofi Kingston. November 19, 2012 – RAW: Wade Barrett defeated Intercontinental champion Kofi Kingston in a non-title match. November 23, 2012 – SmackDown: Intercontinental champion Kofi Kingston defeated Damien Sandow to retain the title. November 26, 2012 – RAW: Intercontinental champion Kofi Kingston defeated Tensai in a non-title match. November 30, 2012 – SmackDown: Intercontinental champion Kofi Kingston and WWE tag team champions Kane and Daniel Bryan defeated Titus O’Neil, Darren Young and Wade Barrett. December 3, 2012 – RAW: U.S. champion Antonio Cesaro defeated Kofi Kingston, R-Truth and Wade Barrett in a fatal 4-way match to retain the title. December 5, 2012 – Main Event: Kofi Kingston vs Antonio Cesaro ended in a no contest. R-Truth and Intercontinental champion Kofi Kingston defeated U.S. champion Antonio Cesaro and Wade Barrett. December 10, 2012 – RAW: U.S. champion Antonio Cesaro defeated Intercontinental champion Kofi Kingston in a non-title match. December 14, 2012 – Smackdown: Kofi Kingston defeated Alberto Del Rio. December 15, 2012 – Saturday Morning Slam: Intercontinental champion Kofi Kingston defeated Zack Ryder in a non-title match. December 16, 2012 – TLC: WWE Intercontinental champion Kofi Kingston defeated Wade Barrett to retain the title. December 17, 2012 – RAW: Intercontinental champion Kofi Kingston defeated Tensai in a non-title match. December 18, 2012 – SmackDown: WWE tag team champions Kane and Daniel Bryan and Intercontinental champion Kofi Kingston defeated The Prime Time Players and Wade Barrett. December 24, 2012 – RAW: The Miz and WWE Intercontinental champion Kofi Kingston defeated Wade Barrett and U.S. champion Antonio Cesaro. December 29, 2012 – SmackDown: Wade Barrett, Cody Rhodes and Damien Sandow defeated Intercontinental champion Kofi Kingston and WWE tag team champions Kane and Daniel Bryan. December 31, 2012 – RAW: Wade Barrett defeated WWE Intercontinental champion Kofi Kingston to win the title. January 4, 2013 – SmackDown: WWE Intercontinental champion Wade Barrett defeated Kofi Kingston to retain the title. January 17, 2013 – Superstars: Kofi Kingston defeated Michael McGillicutty. January 18, 2013 – SmackDown: U.S. champion Antonio Cesaro defeated Kofi Kingston in a non-title match. January 24, 2013 – Superstars: Kofi Kingston defeated JTG. January 26, 2013 – Royal Rumble FanFest: Kofi Kingston defeated Drew McIntyre. January 30, 2013 – Superstars: Kofi Kingston defeated Michael McGillicutty. February 1, 2013 – SmackDown: Jack Swagger defeated Kofi Kingston. February 8, 2013 – SmackDown: Cody Rhodes defeated Kofi Kingston. February 11, 2013 – RAW: WWE Intercontinental champion Wade Barrett defeated Kofi Kingston in a non-title match. February 15, 2013 – SmackDown: Kofi Kingston defeated Corey Graves in a dark match. February 18, 2013 – Raw: Damien Sandow defeated Kofi Kingston by disqualification (R-Truth interfered). February 28, 2013 – Superstars: Kofi Kingston defeated David Otunga. March 11, 2013 – RAW: Mark Henry defeated Kofi Kingston. March 30, 2013 – Superstars: Kofi Kingston defeated Heath Slater. April 5, 2013 – SmackDown: Jack Swagger defeated Kofi Kingston. April 19, 2013 – SmackDown: WWE United States champion Kofi Kingston defeated WWE Intercontinental champion Wade Barrett in a non-title match. May 4, 2013 – WWE Live Event: U.S. champion Kofi Kingston defeated Antonio Cesaro and Zack Ryder in a 3-way to retain. May 13, 2013 – RAW: WWE United States champion Kofi Kingston defeated Damien Sandow in a non-match title. May 18, 2013 – Live Event: Kofi Kingston defeated Antonio Cesaro to retain the U.S. Title. May 19, 2013 – Extreme Rules: Dean Ambrose defeated WWE United States champion Kofi Kingston to win the title. May 24, 2013 – SmackDown: Kofi Kingston defeated WWE United States champion Dean Ambrose by disqualification in a non-match title. May 24, 2013 – SmackDown: The Shield defeated Kofi Kingston, Randy Orton, and Sheamus. May 27, 2013 – Raw: WWE United States champion Dean Ambrose defeated Kofi Kingston to retain the title. May 31, 2013 – SmackDown: Ryback defeated Kofi Kingston. August 5, 2013 – RAW: Kofi Kingston (Return) defeated Fandango. August 9, 2013 – SmackDown: Fandango defeated Kofi Kingston. August 12, 2013 – RAW: WWE world heavyweight champion Alberto Del Rio defeated Kofi Kingston in a non-title match. August 22, 2013 – Superstars: Kofi Kingston defeated JTG. August 24, 2013 – Live Event: Ryback defeated Kofi Kingston. August 31, 2013 – Live Event: Kofi Kingston defeated Ryback. September 1, 2013 – Live Event: Ryback defeated Kofi Kingston. September 5, 2013 – Superstars: Intercontinental Champion Curtis Axel defeated Kofi Kingston in a non-title match. September 6, 2013 – SmackDown: Kofi Kingston defeated WWE Intercontinental champion Curtis Axel in a non-title match. September 9, 2013 – RAW: Kofi Kingston defeated WWE Intercontinental champion Curtis Axel by disqualification in a non-title match. September 11, 2013 – Superstars: Kofi Kingston defeated Antonio Cesaro. September 15, 2013 – Night of Champions: WWE Intercontinental champion Curtis Axel defeated Kofi Kingston to retain the title. September 18, 2013 – Main Event: Kofi Kingston defeated Fandango w/ Summer Rae. September 19, 2013 – Superstars: Kofi Kingston defeated Drew McIntyre. September 23, 2013 – RAW: WWE world heavyweight champion Alberto Del Rio defeated Kofi Kingston in a non-title match. September 27, 2013 – Live Event: World tag team champions Seth Rollins and Roman Reigns defeated Kofi Kingston and The Miz & Brodus Clay and Tensai in a 3-way to retain the titles. September 28, 2013 – Live Event: WWE tag team champions Seth Rollins and Roman Reigns defeated Kofi Kingston and The Miz & Tons of Funk in a 3-way match to retain the titles. September 30, 2013 – RAW: Kofi Kingston defeated Fandango. October 4, 2013 – SmackDown: Kofi Kingston defeated Big E Langston. October 5, 2013 – Live Event: Kofi Kingston defeated Big E. Langston. October 7, 2013 – RAW: Randy Orton defeated Kofi Kingston. October 10, 2013 – Live Event: Ryback defeated Kofi Kingston. October 11, 2013 – Live Event: Kofi Kingston defeated Fandango. October 12, 2013 – Live Event: WWE United States champion Dean Ambrose defeated Kofi Kingston and The Miz in a 3-way to retain the title. October 17, 2013 – Superstars: Damien Sandow defeated Kofi Kingston. October 18-20, 2013 – Live Event: Ryback defeated Kofi Kingston. October 23, 2013 – Main Event: Kofi Kingston defeated Tyler Breeze in a dark match. October 27, 2013 – Hell in a Cell: Damien Sandow defeated Kofi Kingston. October 30, 2013 – Main Event: Ryback defeated Kofi Kingston. November 4, 2013 – RAW: Alberto Del Rio defeated Kofi Kingston. November 6-10, 2013 – Live Event: Kofi Kingston defeated The Miz. November 11, 2013 – RAW: Damien Sandow defeated Kofi Kingston. November 12-13, 2013 – Live Event: Kofi Kingston defeated The Miz. November 14-16, 2013 – Live Event: WWE United States champion Dean Ambrose defeated Kofi Kingston and Dolph Ziggler in a 3-way match to retain the title. November 20, 2013 – Main Event: Fandango w/ Summer Rae defeated Kofi Kingston. November 24, 2013 – Survivor Series: The Miz defeated Kofi Kingston. November 25, 2013 – RAW: The Miz defeated Kofi Kingston. November 27, 2013 – Main Event: Kofi Kingston defeated Fandango w/ Summer Rae. December 2, 2013 – RAW: Ryback and Curtis Axel defeated the Miz and Kofi Kingston. December 6-8, 2013 – Live Event: Kofi Kingston vs. The Miz ended in a no contest. December 9, 2013 – RAW: The Miz defeated Kofi Kingston. December 15, 2013 – TLC: Kofi Kingston defeated the Miz in a ‘no disqualification’ match. December 20, 2013 – SmackDown: Fandango w/ Summer Rae defeated Kofi Kingston. December 23, 2013 – RAW: Ryback defeated Kofi Kingston. December 25, 2013 – Main Event: Fandango w/ Summer Rae defeated Kofi Kingston. December 28, 2013 – Tribute to the Troops: Kofi Kingston defeated Dolph Ziggler. December 30, 2013 – Main Event: Damien Sandow defeated Kofi Kingston. January 2, 2014 – NXT: Alexander Rusev w/ Lana defeated Kofi Kingston. January 13, 2014 – RAW: Kofi Kingston defeated WWE world heavyweight champion Randy Orton in a non-title match. January 15, 2014 – Main Event: Kofi Kingston defeated Curtis Axel. January 18-19, 2014 – Live Event: Kofi Kingston defeated The Miz. January 20, 2014 – RAW: WWE world heavyweight champion Randy Orton defeated Kofi Kingston by disqualification in a non-title match. January 25, 2014 – Live Event: Kofi Kingston defeated Ryback. January 26, 2014 – Royal Rumble: Kofi Kingston participated in the 30-man Royal Rumble match which was eventually won by Batista. January 27, 2014 – RAW: Alberto Del Rio defeated Kofi Kingston. January 31, 2014 – SmackDown: Kofi Kingston defeated Damien Sandow. February 1, 2013 – Live Event: Bad News Barrett defeated Kofi Kingston. February 2, 2014 – Live Event: Kofi Kingston defeated Bad New Barrett. Kofi Kingston defeated Damien Sandow. February 8, 2014 – Live Event: WWE United States champion Dean Ambrose defeated Kofi Kingston to retain the title. February 15-16, 2014 – Live Event: Kofi Kingston defeated Fandango. February 17, 2014 – RAW: Jack Swagger defeated Kofi Kingston. February 19, 2014 – Main Event: Kofi Kingston defeated Curtis Axel by disqualification. February 27, 2014 – Superstars: Kofi Kingston defeated Damien Sandow. March 7-9, 2014 – Live Event: Kofi Kingston defeated Damien Sandow. March 16, 2014 – Live Event: Kofi Kingston defeated Titus O’Neil. Kofi Kingston and Darren Young defeated Bad News Barrett and Titus O’Neil. March 22-23, 2014 – Live Event: WWE Intercontinental champion Big E defeated Kofi Kingston and Cesaro in a 3-way match to retain the title. March 28, 2014 – Live Event: WWE Intercontinental champion Big E defeated The Miz and Kofi Kingston in a 3-way match to retain the title. April 11, 2014 – SmackDown: Wade Barrett defeated Kofi Kingston. April 17, 2014 – Live Event: Kofi Kingston defeated Heath Slater. April 18, 2014 – Live Event: WWE United States champion Dean Ambrose defeated Kofi Kingston, Cody Rhodes and Dolph Ziggler in a 4-way match to retain the title. April 19, 2014 – Live Event: Kofi Kingston defeated Damien Sandow. April 25-27, 2014 – Live Event: Kofi Kingston defeated Titus O’Neil. April 29, 2014 – Main Event: Bad News Barrett defeated Kofi Kingston. May 5, 2014 – RAW: Alexander Rusev defeated Kofi Kingston. May 9, 2014 – SmackDown: Alexander Rusev defeated Kofi Kingston. May 16, 2014 – Superstars: Kofi Kingston defeated Titus O’Neil. May 31, 2014 – Live Event: Cesaro defeated Kofi Kingston. June 1, 2014 – Payback: Kofi Kingston fought Bo Dallas to a no contest because Kane interfered. June 2, 2014 – RAW: Bo Dallas defeated Kofi Kingston. June 3, 2014 – Main Event: Erick Rowan and Luke Harper defeated Kofi Kingston and Goldust. June 7, 2014 – Live Event: Kofi Kingston defeated Damien Sandow. June 8, 2014 – Live Event: Cesaro defeated Kofi Kingston, Damien Sandow and Jack Swagger in a 4-way match. June 13-15, 2014 – Live Event: Kofi Kingston defeated Ryback. June 20-22, 2014 – Live Event: Intercontinental champion Bad News Barrett defeated Kofi Kingston and Rob Van Dam in a 3-way match to retain the title. June 23, 2014 – RAW: Jack Swagger defeated Kofi Kingston. June 24, 2014 – Main Event: Bad News Barrett, Seth Rollins and Jack Swagger defeated Kofi Kingston, Dolph Ziggler and Rob Van Dam. June 28, 2014 – Live Event: Kofi Kingston defeated The Miz. July 10, 2014 – Live Event: Kofi Kingston and Big E defeated Luke Harper and Erick Rowan. July 11, 2014 – Live Event: Cesaro defeated Kofi Kingston. July 12, 2014 – Live Event: Kofi Kingston and Big E defeated Luke Harper and Erick Rowan. July 15, 2014 – Main Event: Kofi Kingston and Big E defeated Ryback and Curtis Axel. July 18, 2014 – SmackDown: Alberto Del Rio defeated Kofi Kingston. July 21, 2014 – RAW: Ryback and Curtis Axel defeated Big E and Kofi Kingston. July 22, 2014 – Main Event: Kofi Kingston and Big E defeated Heath Slater and Titus O’Neil. July 26-27, 2014 – Live Event: Intercontinental champion The Miz defeated Kofi Kingston to retain the title. August 1, 2014 – Smackdown! : Goldust and Stardust defeated Kofi Kingston and Big E in a dark match. August 3, 2014 – Live Event: Kofi Kingston defeated Bo Dallas. August 7, 2014 – Live Event: Intercontinental champion The Miz defeated Kofi Kingston to retain the title. August 9, 2014 – Live Event: Intercontinental champion The Miz defeated Kofi Kingston to retain the title. August 25, 2014 – RAW: Bo Dallas defeated Kofi Kingston. August 30, 2014 – Smackdown! : Kofi Kingston and Big E defeated Heath Slater and Titus O’Neil in a dark match. September 6-7, 2014 – Live Event: Big E and Kofi Kingston defeated The Ascension. September 12-14, 2014 – Live Event: Goldust and Stardust defeated Big E and Kofi Kingston. September 16, 2014 – Main Event: Kofi Kingston defeated Tyler Breeze in a dark match. September 19, 2014 – Live Event: WWE tag team champions The Usos defeated Xavier Woods and Kofi Kingston & Stardust and Goldust in a 3-way tag team match to retain. September 23, 2014 – Main Event: Kofi Kingston defeated Bo Dallas. September 26, 2014 – Live Event: Big E and Kofi Kingston defeated Los Matadores. September 30, 2014 – Main Event: Tyson Kidd defeated Kofi Kingston. October 2, 2014 – Superstars: Kofi Kingston defeated Sin Cara. October 5, 2014 – Live Event: Big E and Kofi Kingston defeated Goldust and Stardust. October 10-11, 2014 – Live Event: Big E and Kofi Kingston defeated Luke Harper and Erick Rowan. October 23, 2014 – Superstars: Tyson Kidd defeated Kofi Kingston. October 31, 2014 – Smackdown! : Kofi Kingston defeated Curtis Axel in a dark match. November 5-9, 2014 – Live Event: Kofi Kingston and Big E defeated Luke Harper and Erick Rowan. November 15, 2014 – Live Event: Big E and Kofi Kingston defeated The Miz and Damien MizDow. December 7, 2014 – Live Event: Big E and Kofi Kingston defeated The Miz and Damien MizDow. December 8, 2014 – RAW: Kofi Kingston defeated Stardust. December 14, 2014 – TLC…and Stairs: A New Day (Kofi Kingston and Big E) defeated Goldust and Stardust. December 27, 2014 – Live Event: Big E and Kofi Kingston defeated Goldust and Stardust & Cesaro and Tyson Kidd in a 3-way tag match. January 4, 2015 – Live Event: Big E, Kofi Kingston and Xavier Woods defeated Curtis Axel, Goldust and Stardust. January 9-10, 2015 – Live Event: Kofi Kingston defeated Bad News Barrett. January 13, 2015 – Main Event: Big E, Kofi Kingston and Xavier Woods defeated Cesaro, Tyson Kidd and Adam Rose w/ Natalya. January 20, 2015 – Main Event: Kofi Kingston w Big E and Xavier Woods defeated Tyson Kidd w Cesaro and Natalya. January 25, 2015 – Royal Rumble Kickoff: Cesaro and Tyson Kidd w Natalya defeated Big E and Kofi Kingston w/ Xavier Woods. February 13, 2015 – Live Event: Big E and Xavier Woods defeated Goldust and Stardust. Intercontinental champion Bad News Barrett defeated Jack Swagger and Kofi Kingston in a 3-way match to retain the title. March 5, 2015 – SmackDown: Big E and Kofi Kingston defeated the Miz and Damien Sandow. April 23, 2015 – SmackDown: Kofi Kingston defeated Cesaro. May 14, 2015 – SmackDown: Tyson Kidd defeated Kofi Kingston. June 18, 2015 – SmackDown: Neville defeated Xavier Woods w The New Day. July 4, 2015 – WWE Live from Tokyo: The Beat in the East: The Lucha Dragons defeated Big E and Xavier Woods in a dark match. Brock Lesnar defeated Kofi Kingston. July 24-26, 2015 – Live Event: WWE tag team champions The Prime Time Players defeated Big E and Xavier Woods w Kofi Kingston to retain the titles. July 25, 2015 – Main Event: Big E and Kofi Kingston w Xavier Woods defeated The Lucha Dragons. August 2, 2015 – Live Event: WWE tag team champions The Prime Time Players defeated Kofi Kingston and Xavier Woods w Big E to retain. August 15, 2015 – Live Event: WWE tag team champions The Prime Time Players defeated Kofi Kingston and Xavier Woods w Big E to retain the titles. August 21, 2015 – Live Event: WWE tag team champions The Prime Time Players defeated The Lucha Dragons & Big E and Kofi Kingston in a 3-way to retain the titles. September 4-6, 2015 – Live Event: WWE tag team champions Big E and Kofi Kingston defeated The Lucha Dragons to retain the titles. October 3, 2015 – WWE Live from MSG: Lesnar vs Big Show: WWE tag team champions Big E and Kofi Kingston w Xavier Woods defeated The Dudley Boyz by disqualification to retain the titles. October 12, 2015 – RAW: WWE tag team champions the New Day defeated Randy Orton and Dean Ambrose in a non-title match. October 31, 2015 – Live Event: WWE tag team champions Big E and Kofi Kingston defeated The Prime Time Players to retain. July 23, 2016 – Live Event: Kofi Kingston defeated Erick Rowan. January 29, 2017 – Royal Rumble: Kofi Kingston was in the Royal Rumble match won by Randy Orton. January 28, 2018 – Royal Rumble: Big E came in the Royal Rumble match at #16, in which Shinsuke Nakamura won. January 27, 2019 – Royal Rumble: Kofi Kingston entered the Royal Rumble match at #12 but was won by Seth Rollins. March 23, 2019 – Live Event: The New Day (Kofi Kingston and Xavier Woods) defeated SAnitY (Eric Young and Killian Dain). March 26, 2019 – SmackDown Live: Big E & Xavier Woods won a tag team gauntlet that makes Kofi Kingston the #1 contender for the WWE title at WrestleMania 35. March 29-31, 2019 – Live Event: Kofi Kingston defeated Elias. April 2, 2019 – SmackDown Live: The contract signing for Kofi Kingston vs. Daniel Bryan at WrestleMania 35 for the WWE title took place. 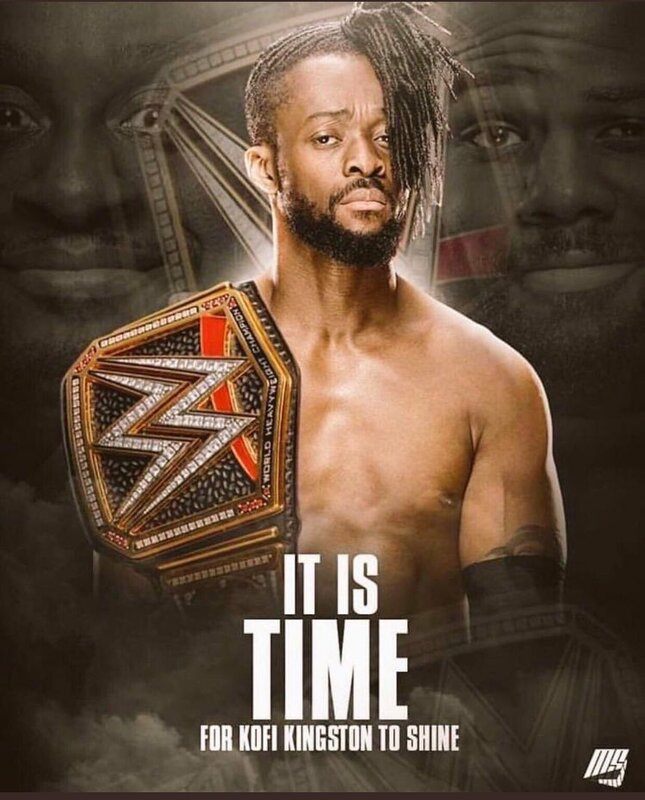 April 7, 2019 – WrestleMania 35: Kofi Kingston defeated Daniel Bryan to win the WWE title. @ZackRyder @TheTruekofi How did I miss this pic?! What a throwback! Taken in Gray, GA in 2006 I believe?